Six cars present. Bill got his rotors replaced. Shannon got his “eyebrows” straitened. Brandon got some stainless scratches worked out. Thomas and Robert got an A/C recharge. What did Jay get? Well...um, he got the privilege of us using his shop for half a day. Yeah that's it! #1, Seven guys... two with a beverage, one talking on the phone, three watching, and only one actually working (Brandon, far left). Now that's my kind of tech day! #2, More proof that it was Brandon that was actually working. #3, Elsewhere, Shannon gets an eyebrow lift :) (works on his fascia). #4, "Discussing" what needs to be done (L to R; Goodwin, Kidd, Mims). 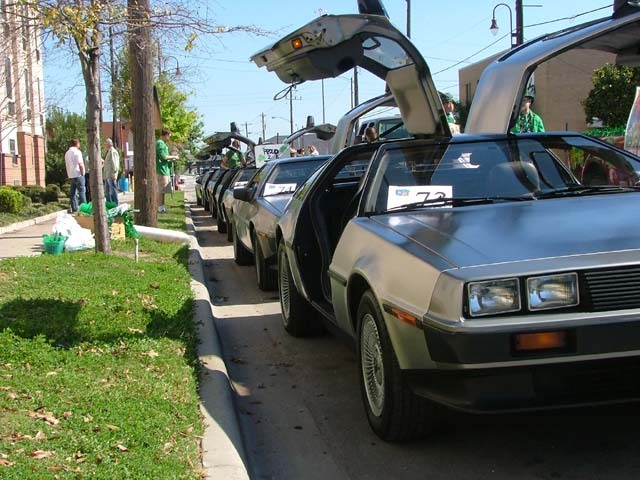 Eight DeLoreans participate in the parade in downtown Houston. 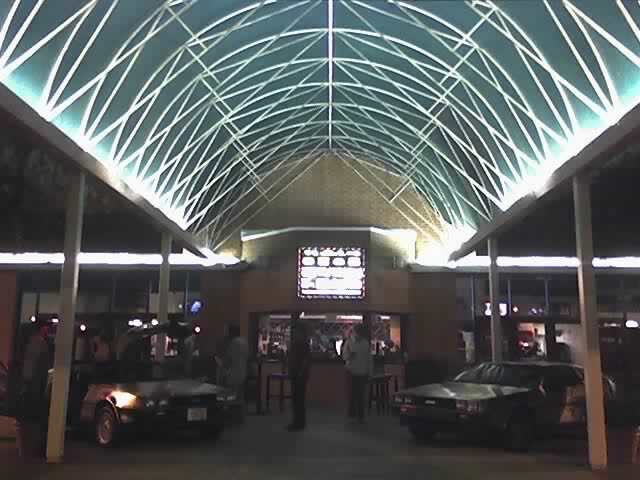 Afterwards, most attend a good lunch at Houston's restaurant. #1, Rumor has it Shannon dumped more than a few bottles of green beer in his tank and this is the result (everyone knows you NEVER put in more than one beer per tank, of ANY color). 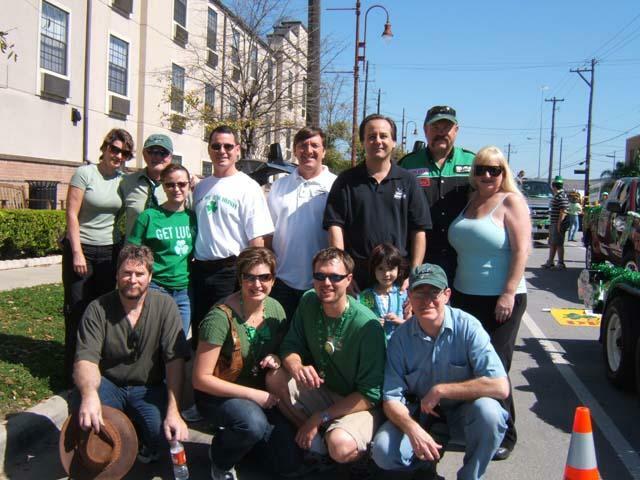 #2, Some meet at DMC to caravan from Humble to the downtown area (while some remain in the car sleeping on the job!). #4, Rogues Gallery, (kneeling, L to R) Thomas Kidd, Jeanie & Robert Goodwin, Shannon Birdwell. 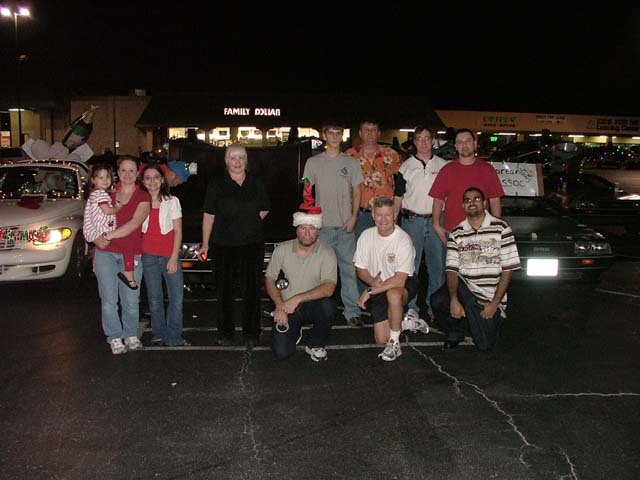 (standing, L to R) Julie & Bill Swilley, Crystal & Brandon Mims, Stephen Wynne, James Espey & Nichole, Bill & Rose Ballard. 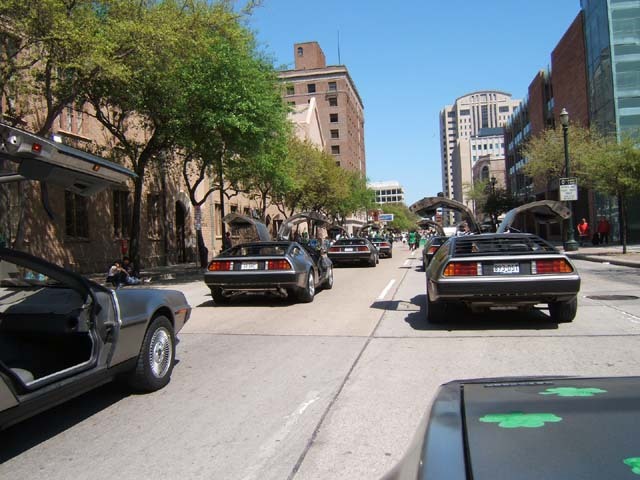 #5, Eight DeLoreans in the parade, double file. 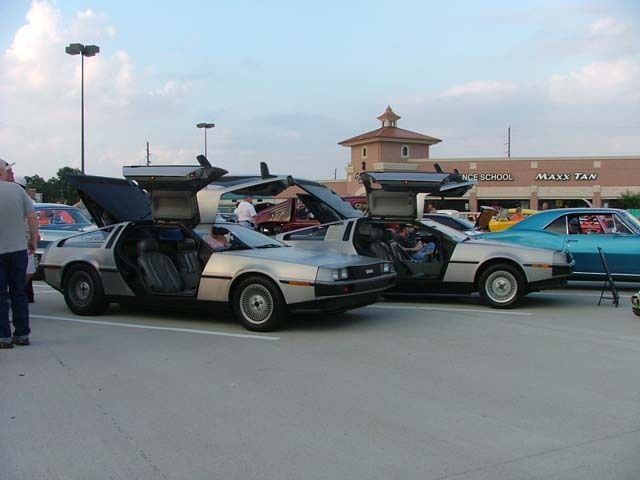 An impromptu meet was called for DeLorean owners for Saturday night. 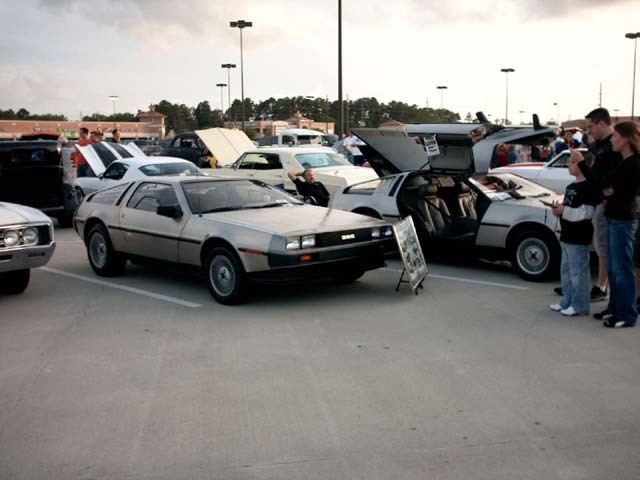 An estimated 150 classic cars were present. 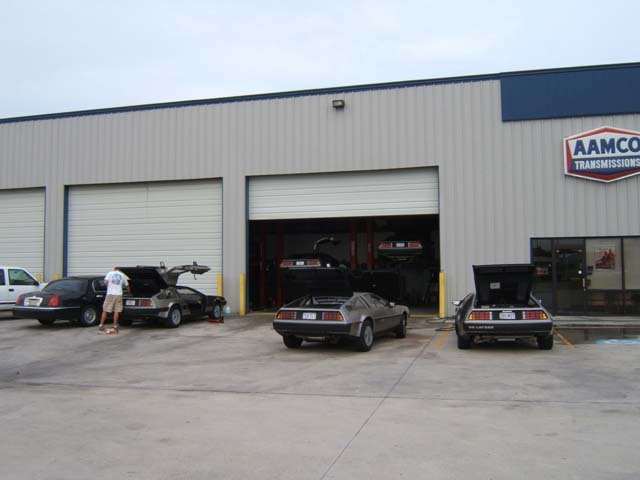 Two DeLoreans showed up (Ballard, Kidd). After a day of threatening rain, the evening ended very pleasant. #1, Spectators gawk in amazement at the dual marvel right in front of them (who’s partial? ), while Bill takes a breather. #2, One car with doors and engine compartment open for inspection by on-lookers, while the other closed up (as if on the road) for pictures. 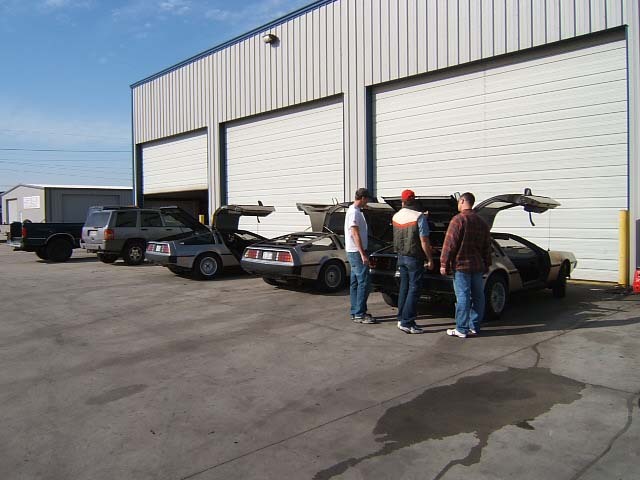 Two club DeLoreans were present (Mims, Birdwell). Brandon's car (VIN 06500) took first place in the Import Class. #1, Brandon's car at Conroe. 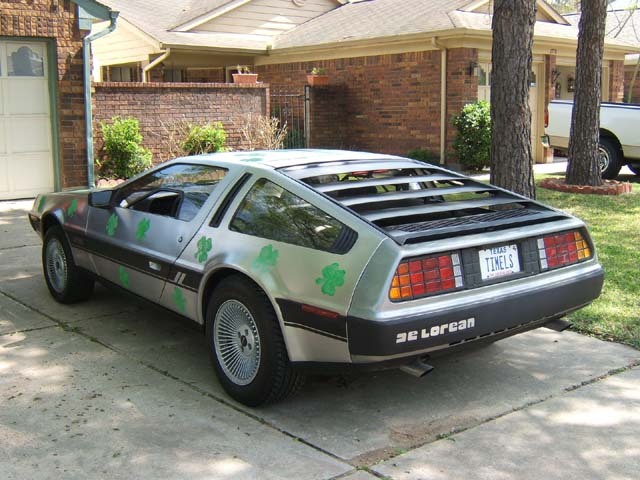 Three club DeLoreans entered (Birdwell, Mims, Owen). 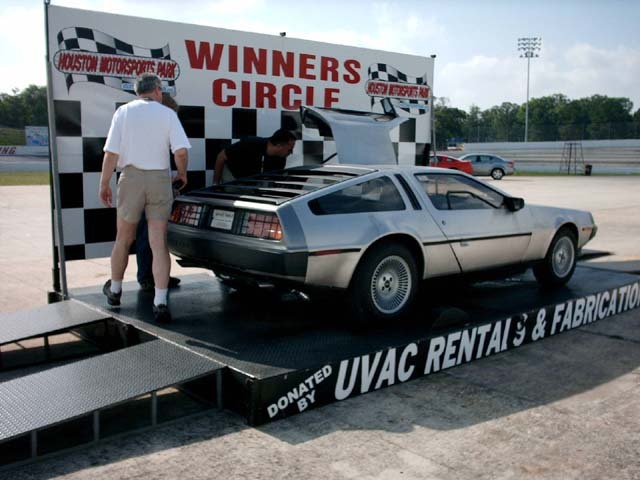 #1, The three DeLorean entrants. #2, A closer shot of Heath's car. 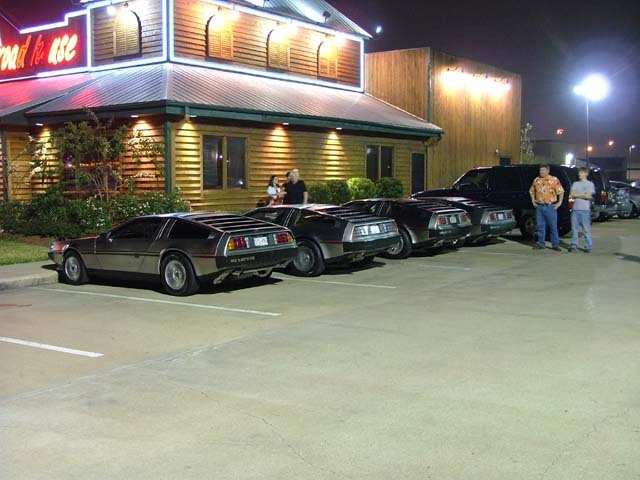 After weeks of hard work, two club DeLoreans meet on a cool Saturday night (Ballard, Mims) to relax and reminisce. Again, narrowly missing thunder storms. 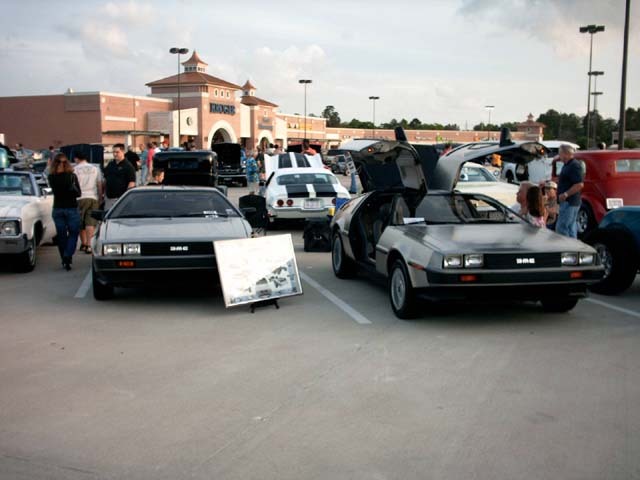 Niftee50ees is a standing, informal Saturday night street meet in Houston during the summer months, and has become a popular place for DeLorean Owners to visit, reflect or lament. #1, Mims car left, Ballard right. 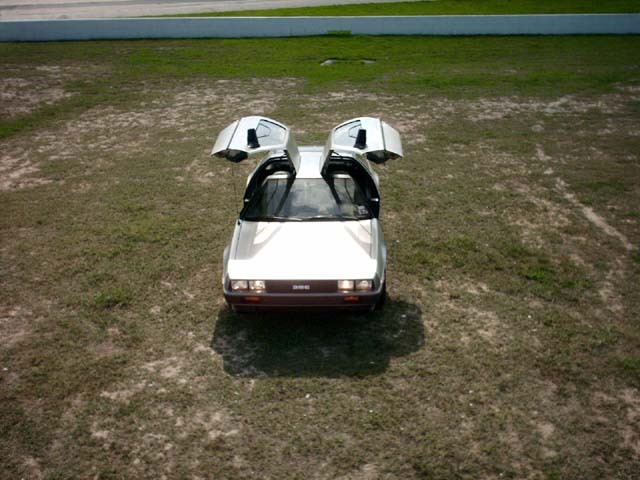 #2, Lights, camera, DELOREAN. (This picture is a bit unordinary, and is included here for just that reason. 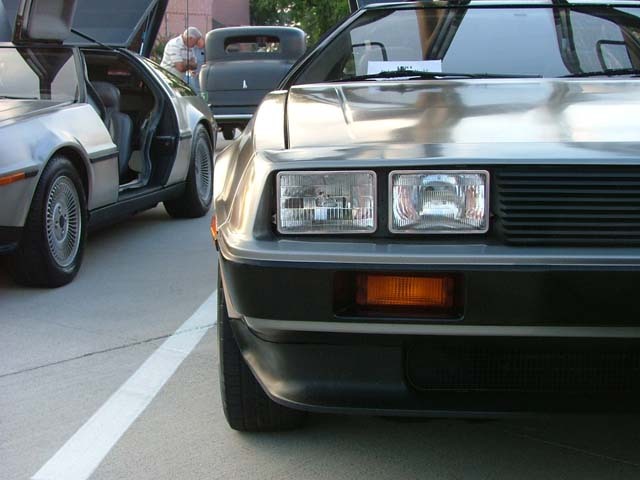 And to let you know what a set of DeLorean headlights look like up close...just in case you wanted to know.) Is that not the shiniest stainless steel you've every seen, or what? Friday registration and opening session. #1, When you come to one of these things, they give you a free front facia, a chain, a sign and a bottle of champagne on ice. 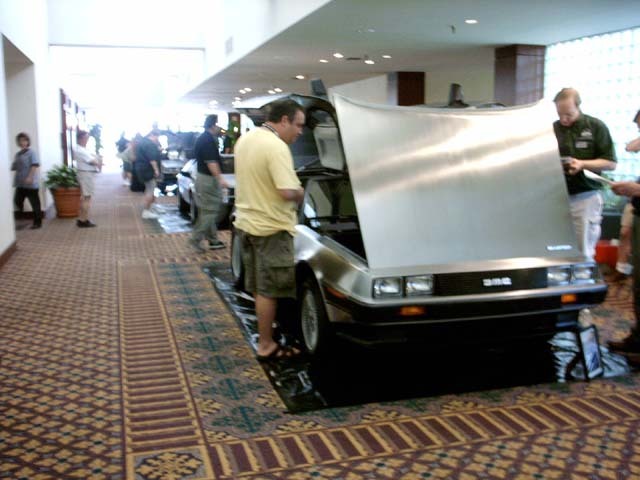 #2, "Video Bob's" partially completed BTTF car made an appearance. 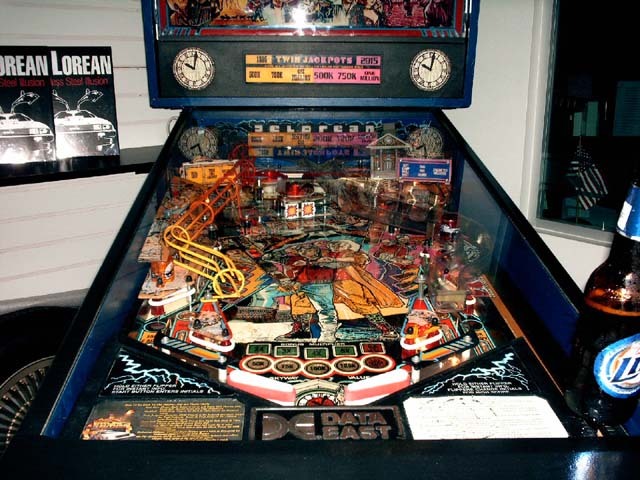 #3, A DeLorean pin-ball machine? It had free credits so all the cheap guys like me could play. 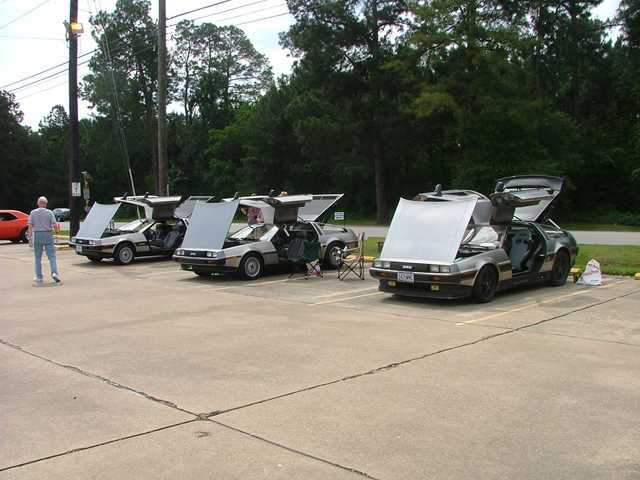 #4, Some DeLoreans securely parked in a reserved area behind the Doubletree Hotel. Saturday Millennium Concours at the Doubltree Hotel and technical seminars at DMCH. 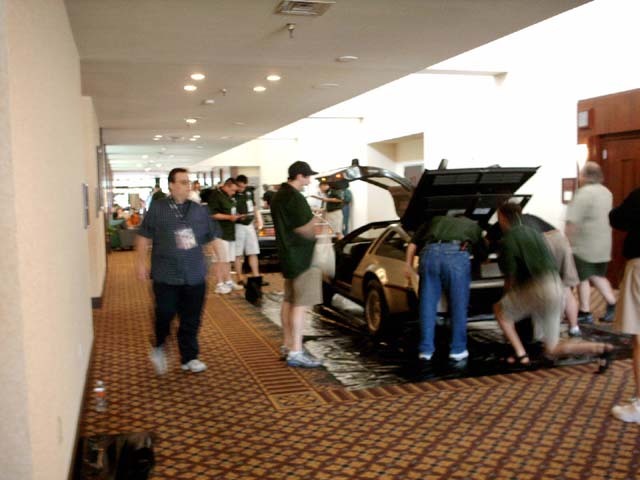 #1, The Concours cars lined up in the hotel convention area hallway. This is better than handicapped parking, sheesh! 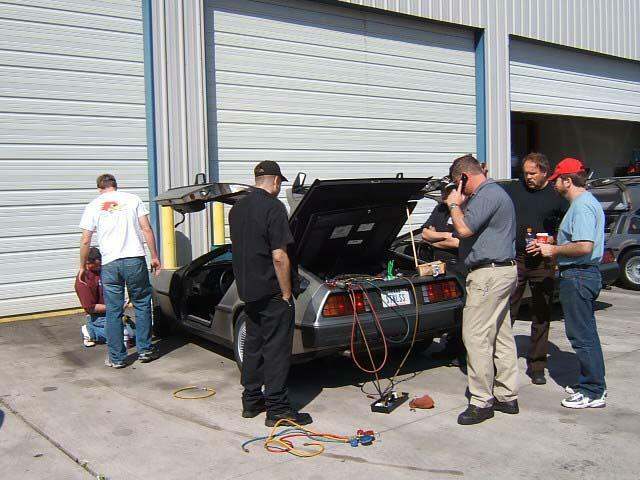 #2, There's something interesting going on under that car, but what??? 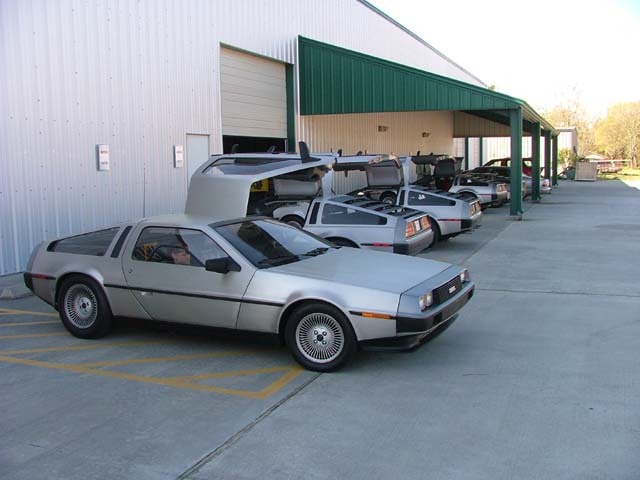 #3, A virtual smorgasbord of DeLoreans. #4, Lots of simultaneous activty going on throughout the day Saturday at headquarters. 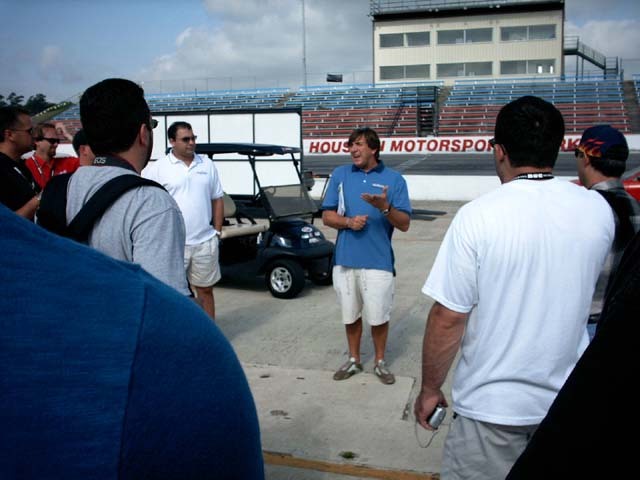 Sunday at Houston Motorsports Park. 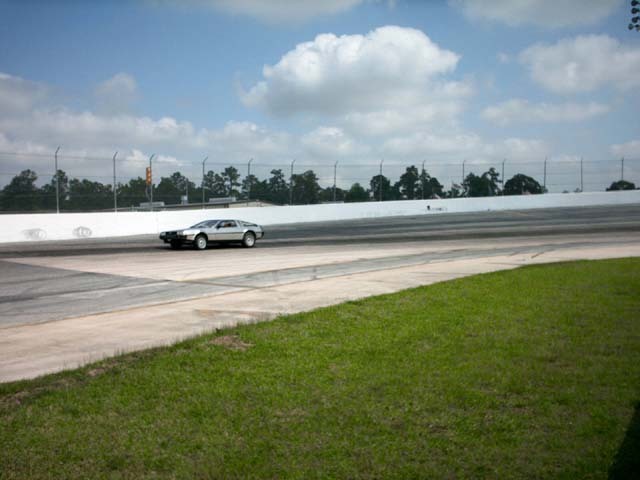 #2, The first car goes up on the track alone. Each driver took a few laps alone to get the "feel" of track. #3, Finally, after much anticipation, multiple cars went after it. 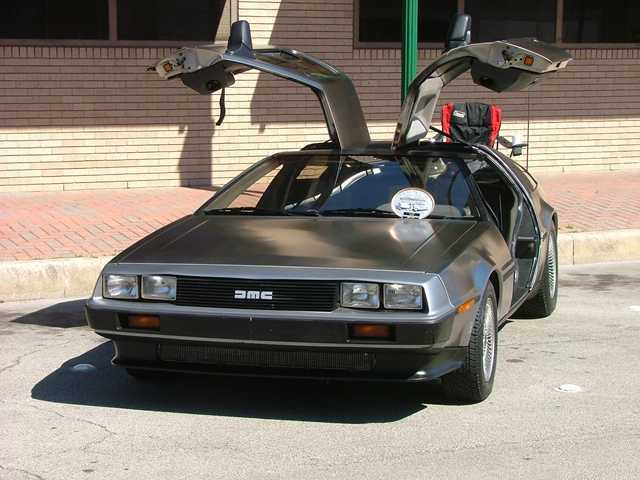 #4, The DMC-12 proves to have remarkable handling! #6, Lining up for a group shot. This took more cooperation than what appears on the surface. #7, The final group shot. (Other pictures were taken with doors down, and with the drivers in various positions, and from various angles.) Obviously there were many more cars attending the Open House, but for some reason did not go to the track. The yellow and red cars on the two ends was a nice touch. (Comments by Shannon Birdwell) We had a great tech day today. Those who came were: Jay Streckfuss, Thomas Kidd, Bill Ballard, Roger Dartt, Robert Goodwin, Brandon Mims, and myself - Shannon. I got to Jay's shop right before 8:00 and except for one or two people everyone else was there. 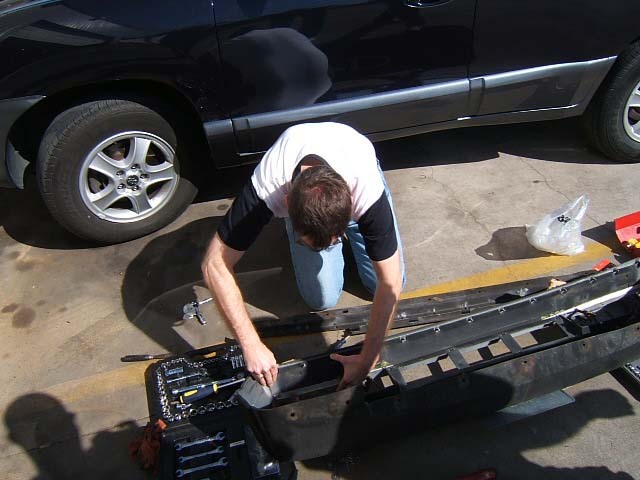 I was really touched by everyone's willingness to donate their time and parts to help the other owners. Brandon replaced his fans with ones that had a shroud, a couple of us had the AC systems recharged, I had my windshield washer bottle put in after I changed the motor in it. 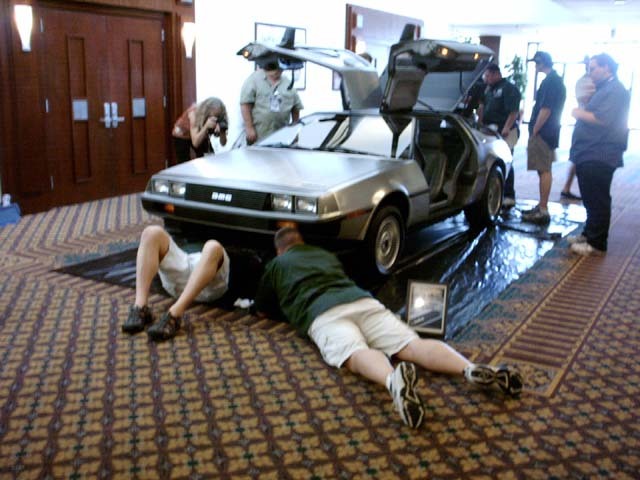 Others had things done to their cars. 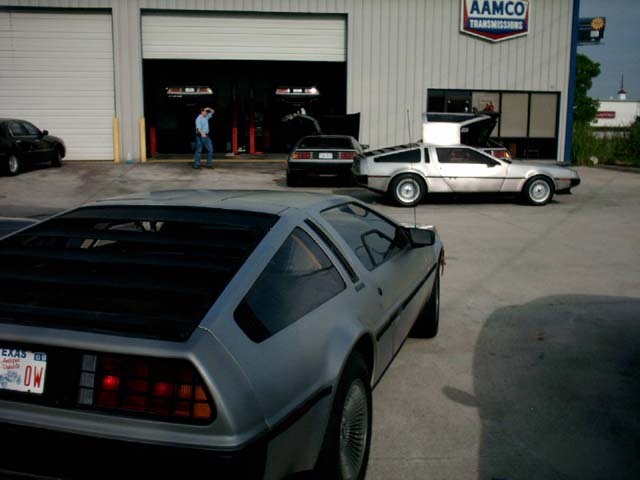 #1, "That AAMCO transmission shop sure works on a lot of DeLoreans!" 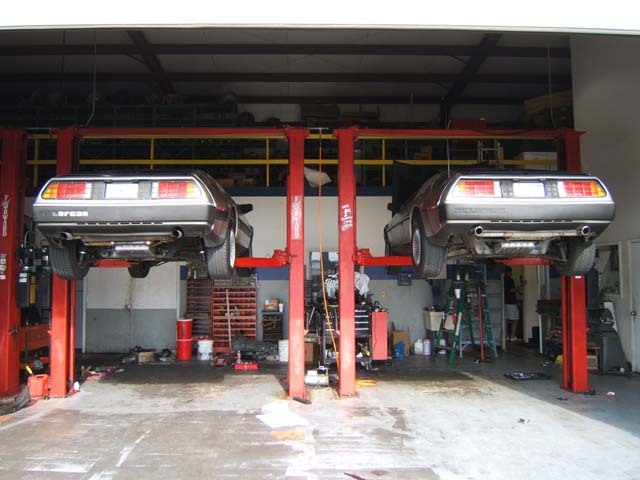 #2, Dual DeLoreans, in flight (okay, in the air at least). 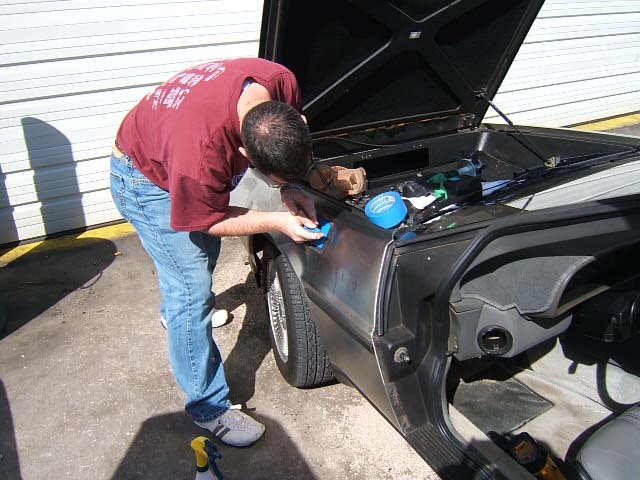 #3, "I've got six frame-off DeLorean restorations to finish by 5 o'clock today, then it's MILLER TIME!" 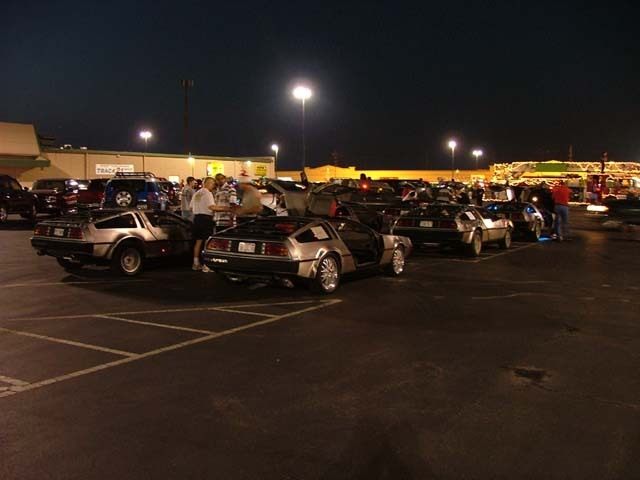 A club meeting was held at the Saturday night Niftee50ees street meet. In attendance: Bill Ballard, Shannon and Susi Birdwell, Thomas Kidd, Owen Malbec, Brandon and Crystal Mims, and Heath and Antje Owen (who drove in from Austin). This time we didn’t narrowly miss the storms. Things started out okay, but later we got an initial sprinkling. A subsequent clearing looked promising. Then a little while later, the meet had to be called due to severe thunderstorms in the area. Not to be deterred, members took refuge in Bill's air conditioned trailer and completed the club meeting. #1, Four of six cars arrived early to reserve space and prepare. 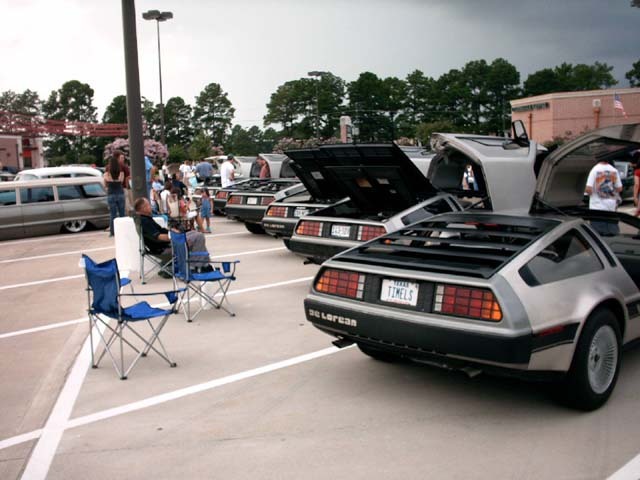 #2, Six DeLoreans in line are always popular with the crowds (especially the kids). You can see clouds starting to build. #3, Another angle, and the clouds continued to build. #4, This is about all we get accomplished at club meetings. 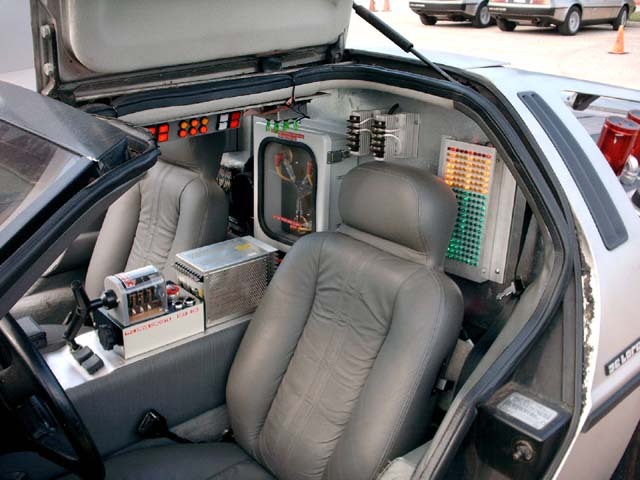 We read DeLoreans magazines, just for the articles of course. 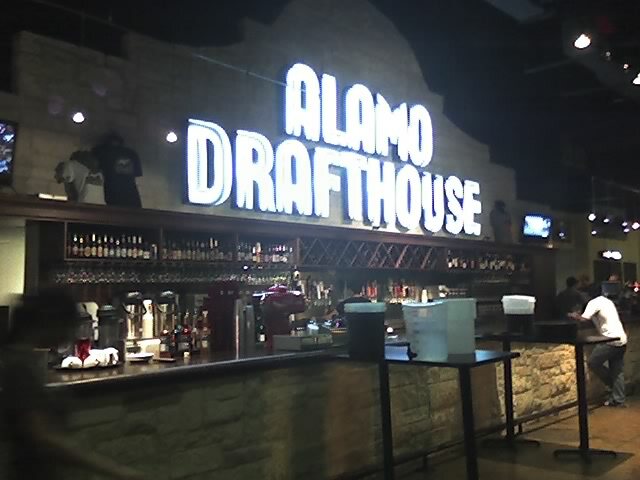 (Comments by Shannon Birdwell) We had a great time at the Alamo Drafthouse this past weekend. Friday night had Thomas Kidd and Shannon Birdwell there. Saturday noon there was Shannon and Susi Birdwell, Thomas Kidd, Dwayne and Mary Jane Arnold, Frank Lucco and Kolby Klenik. Saturday night Bill and Rose Ballard, Dwayne and Mary Jane Arnold, Chip Storey and his son, Shannon and Roger Dartt. 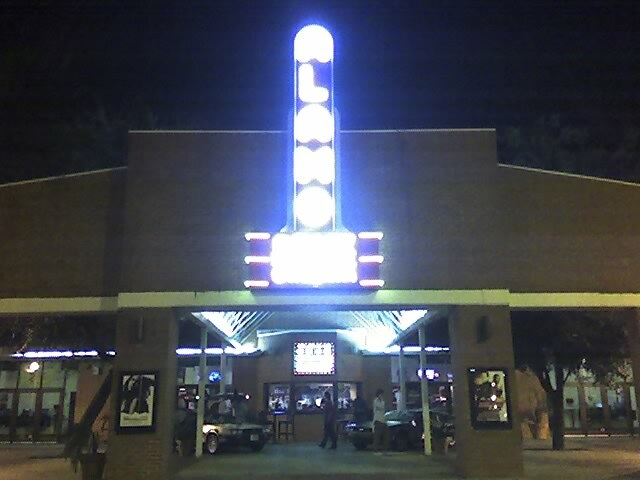 Judd and the staff at the Alamo treated us like VIPs and they did a great job. People stopped to take pictures and ask questions. Many thanks to Brett Neumann for organizing this and to Judd for their hospitality! #1, Hey, this place has a bar in it. That means...you guessed it...they serve beer! I guess that's why they call it a "draft" house. 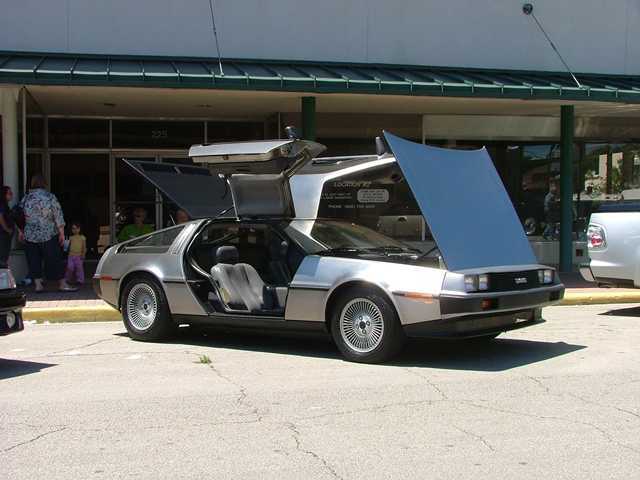 #2, Customers had to walk between DeLoreans to purchase a ticket. 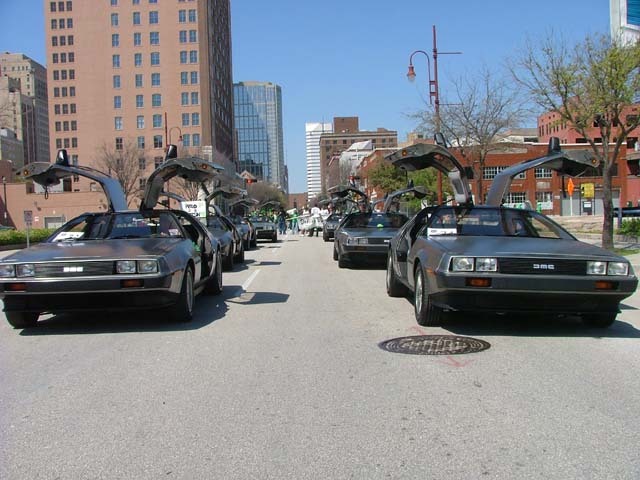 #3, All the BTTF fans were truly appreciative that a number of DMC-12's were on display. 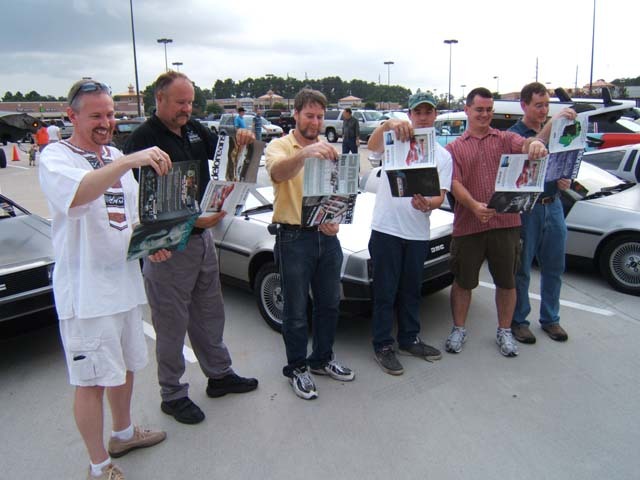 These BTTF guys and gals are definitely DeLorean fans. This was a two day event, Saturday and Sunday. Saturday afternoon, there was a road rallye followed by a dinner. The show itself was on Sunday. 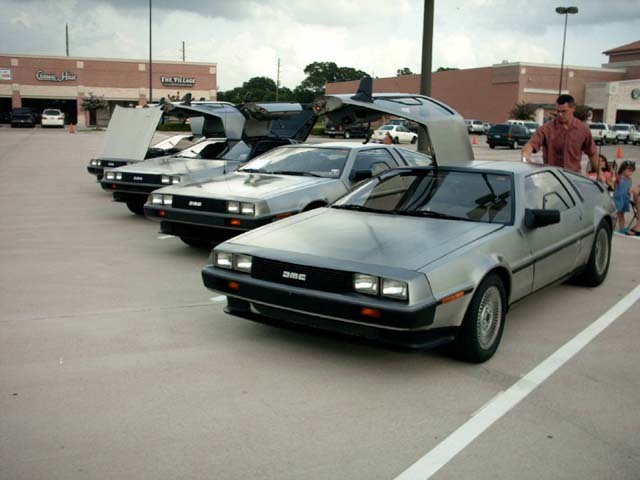 There were 11 2/3 DeLoreans on display (that's right, the 2/3rd car was an underbody/frame display from DMC-Texas. Thanks James!). This is a club best, as last year there were ten. 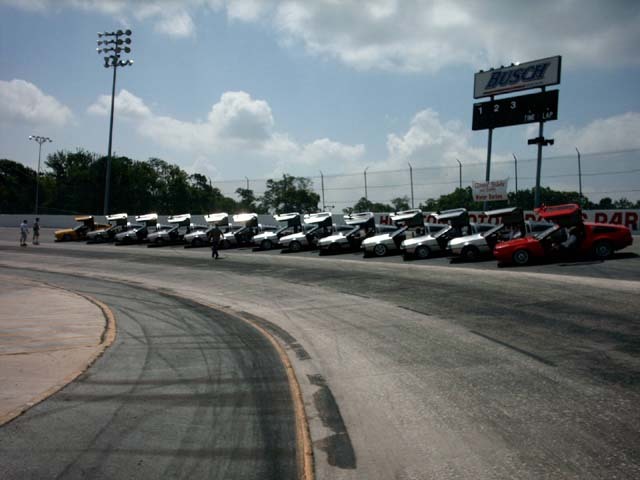 Three of the cars were from Austin (Owen, Joyner, Schlachter), the other eight from Houston. From Houston, four arrived Saturday (Ballard, Birdwell, Mims, Streckfuss) and the remaining on Sunday (Dartt, Espey, Kidd, Swilley). 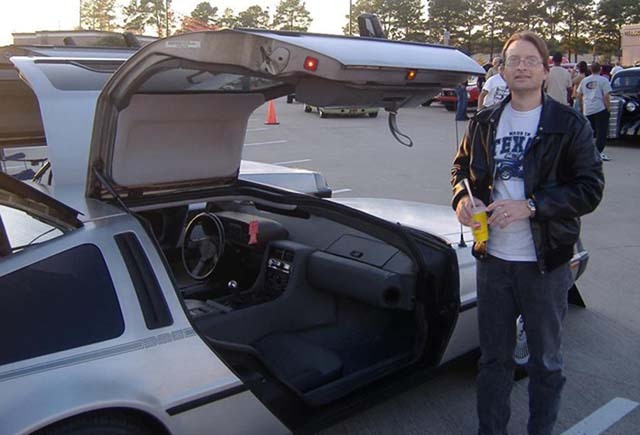 Some of the trip from Houston-Austin-Houston was 'You-Tubed' called DeLoreans Gallore on Hwy 290 (thanks Brandon & Crystal!). Enjoy! 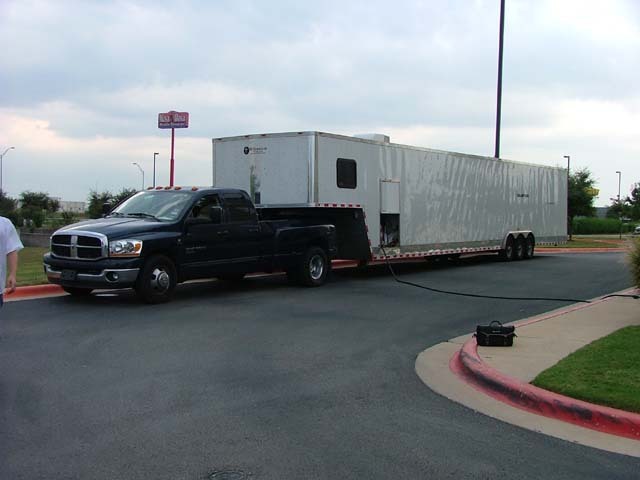 #1, "The Transporter", compliments of the Ballards, transported the frame/underbody to the show for the club display. 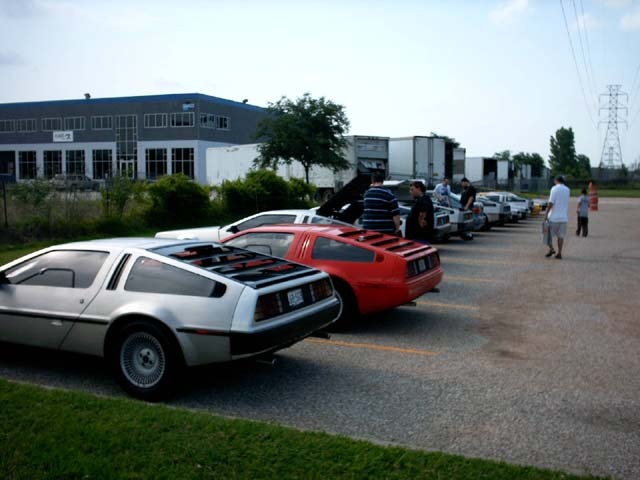 This trailer has the capacity for carrying up to 2+ DeLoreans. #2, Inside the Transporter room. 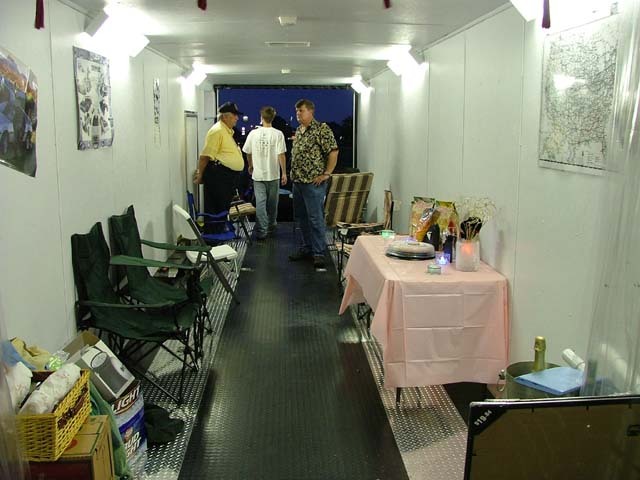 This trailer doubled as the club's hospitality suite Saturday night. 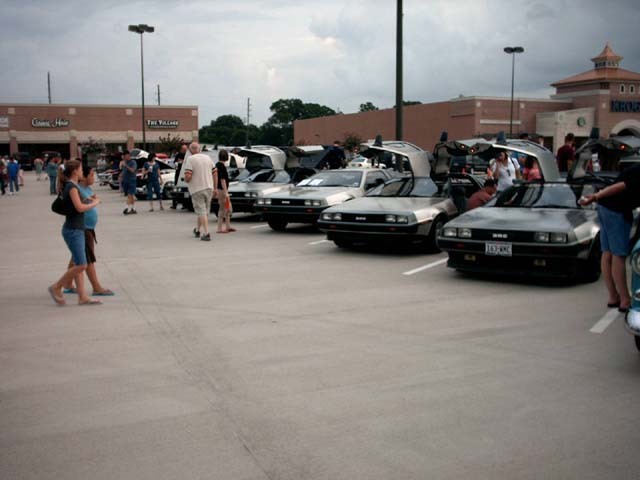 #3, The line of DeLoreans at the show on Sunday. 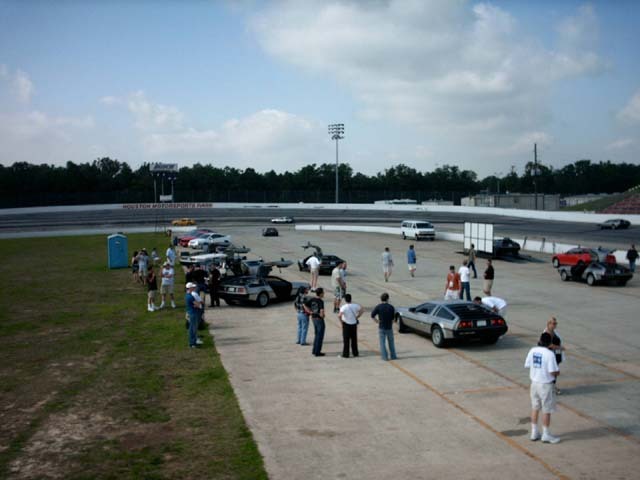 It's hard to see all 11 cars in this picture, and the club display is at the far end (not visible). 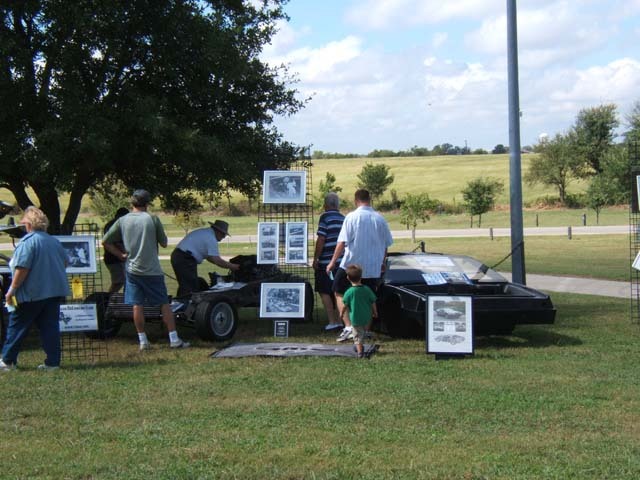 #4, The club display, which consisted of an exposed frame and separated underbody, were compliments of DMC-Texas. 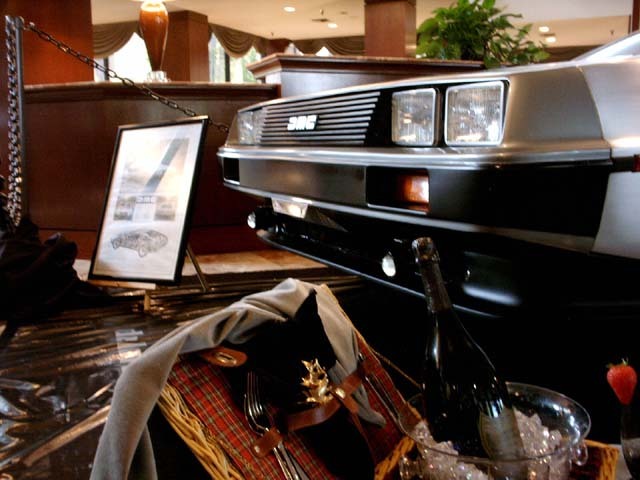 Photos of early DeLorean production were on display. Club advertisements and fliers were available. 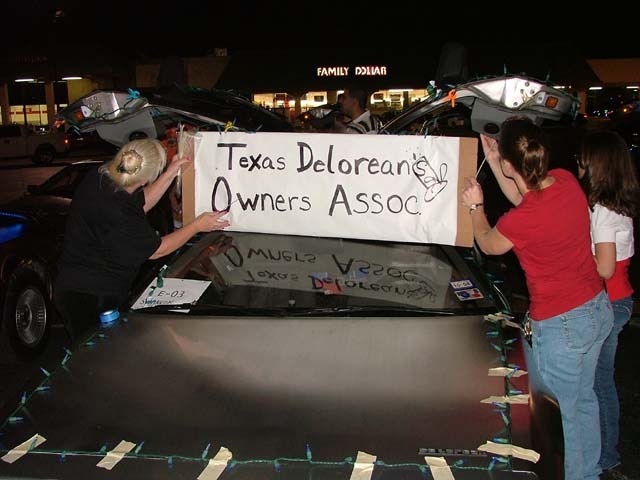 The Texas DeLorean Club took the award for Best Club Display from those annoying Triumph Club guys, who had been winning it year after year. These are initial pictures from the annual show that again brought out so many cars that there were not enough spaces for everyone. Some cars had to park in the isles. 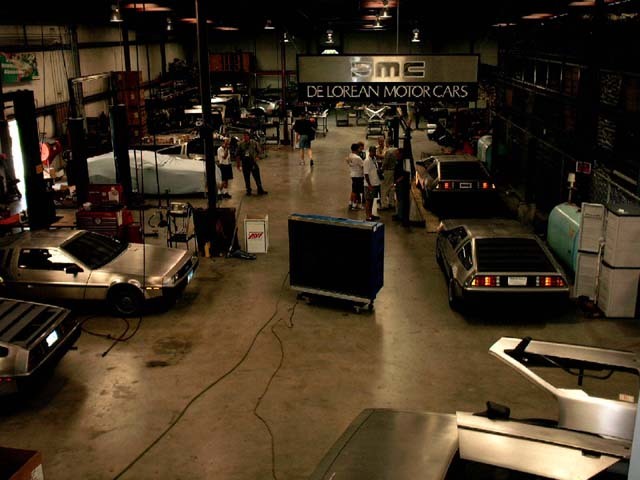 Six DeLoreans showed up (Birdwell, Bharwani, Kidd, Streckfuss, Mims, Owen). 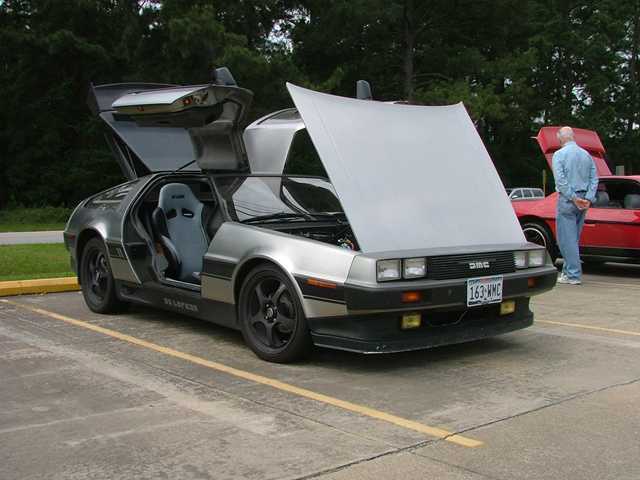 #2, The Texas DeLorean Club welcomes its newest member. 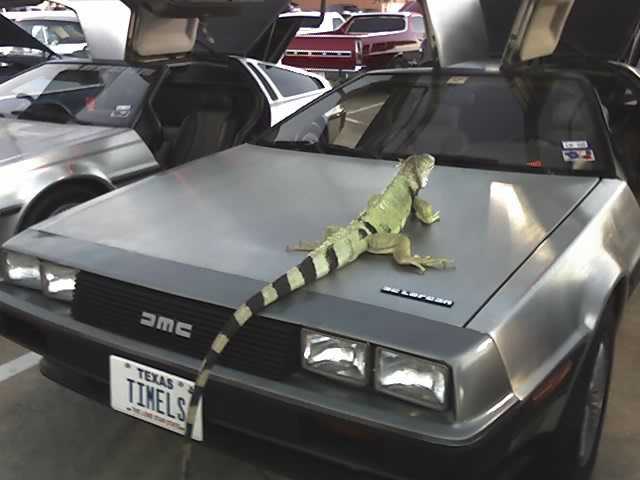 Well, um, let's just say he really liked DeLoreans a lot and wanted to join up, so we didn't object too much. This is the 10th Annual Texas Volunteer Firefighter's Relief Fund (TVFFRF) Parade of Lights, held on Houston's west side. 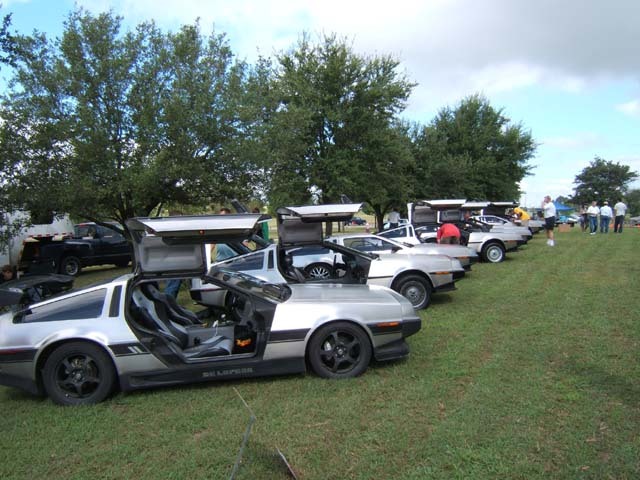 This is the forth year the Texas DeLorean Club has participated. 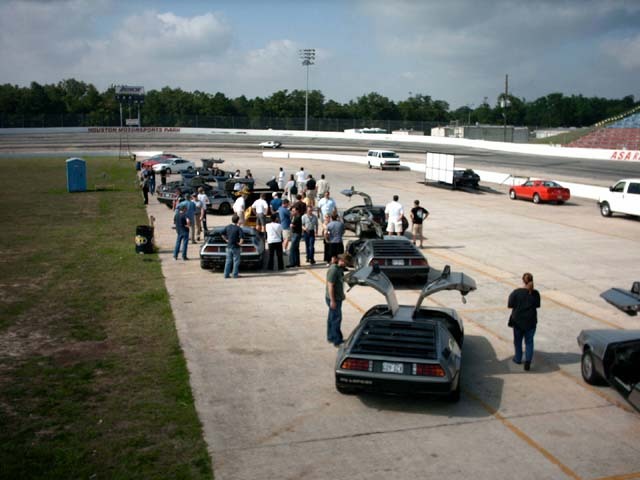 Seven DeLoreans showed up (Ballard, Bharwani, Birdwell, Dartt, Kidd, Mims, Streckfuss). This year was the exact opposite of last year weatherwize. The days high was in the 80's. Last year was so cold you could run your A/C to warm up. Well, that's Houston weather for ya. After the parade, some met at a local restaurant for dinner. #1, The line-up, pre-parade, in the staging area, where everyone helped each other prepare. #2, This is the first year the lead car (Birdwell) carried a club sign, mounted by Rose and Crystal. We don't know how Shannon could see where he was going, but he pulled it off. 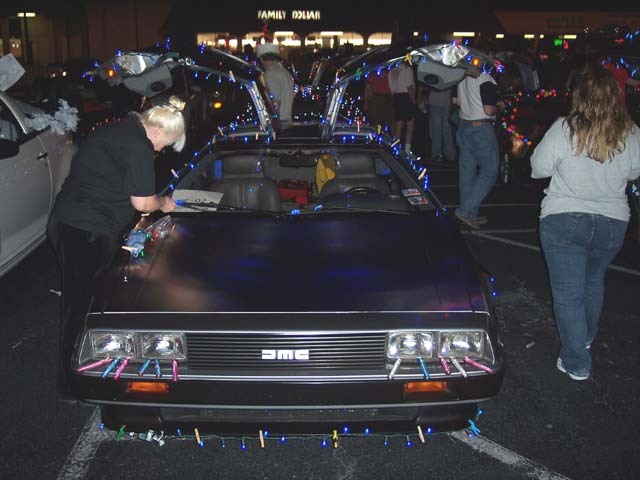 #3, In the staging areay, some of the cars testing lights before the actual parade. 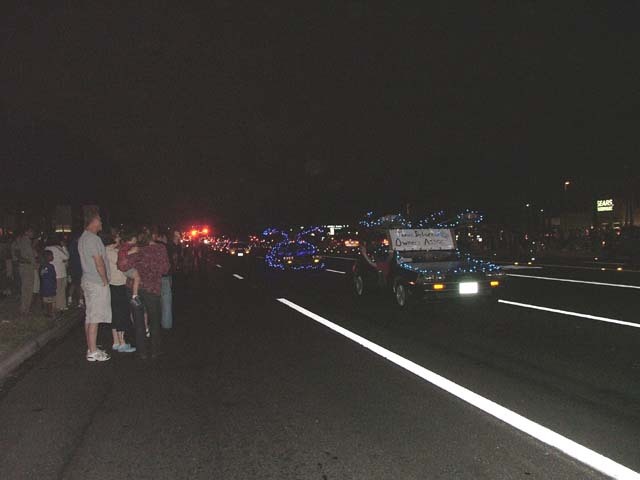 These are dark pictures, but considering it is a parade of lights, dark is a good thing. #4, Ballard's car, with Rose hard at work, and lots of surrounding activity. 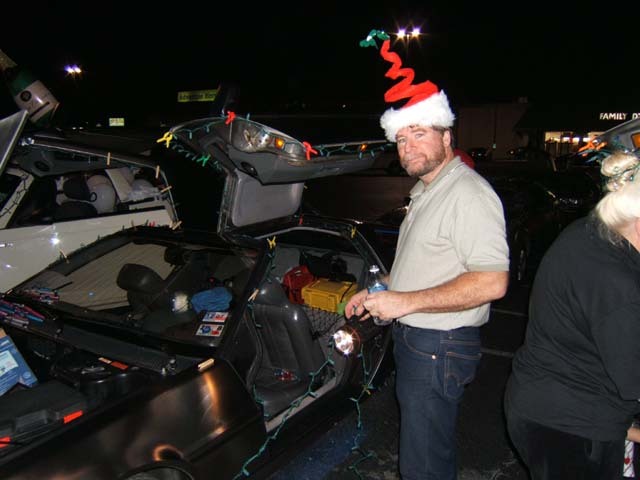 #5, Even the grinch pitched in to help in the preparation (yeah right!...holding a flashlight and a beverage). #6, Group shot of a very warm group. What the heck is Bill doing back there in the back, still adding more lights? 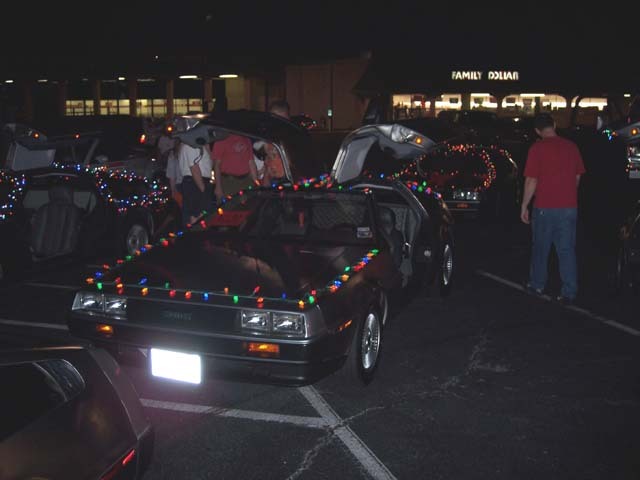 #7, This is how the public saw a line of seven DeLoreans shroweded in Christmas lights. #8, About half of the group met for a well deserved dinner after the Parade.